Teens meet a local scientist and learn about their work. Meet other teens, have snacks and enjoy a science talk and activity. Teen Science Cafes are FREE events where teens can meet a local scientist and find out about their work and career! Meet other teens, have snacks, and enjoy a science talk and activity. This month’s theme: Ideas with Idenm: Interactive storytelling with emerging technology. 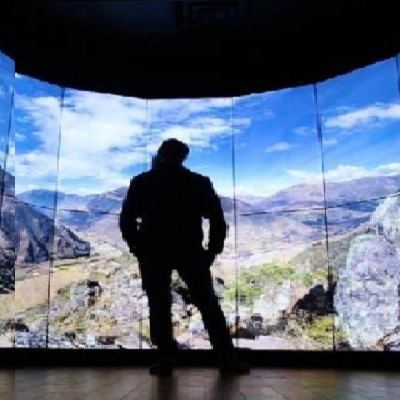 Join guest speakers from Ideum, a local interactive design firm, to learn about designing and planning complex digital installations, including video walls, projection mapping, theater projection, and more. Each of these technologies can be used in a variety of settings to tell important stories about science, art, history, and culture. Ideum’s 40+ employees form an interdisciplinary team that includes designers, software developers, hardware engineers, A/V media specialists, educators, and scientists. In this Teen Science Café, Ideum staff will share their work, discuss the paths they took to exhibit design and development, and answer questions about careers that integrate science, art, and technology.